Sometimes in our lives there are moments that determine our destiny; thus, this was my “Ahh-ha” moment! A closer look through my magnifying glass, my constant companion, transported me into a whole new world of botanical wonder! Encouraged by my family and friends, I ventured into further illustrations that focus specifically on our unique native flora; not always as big and bold as many exotics, but rather more discreet and gorgeous! 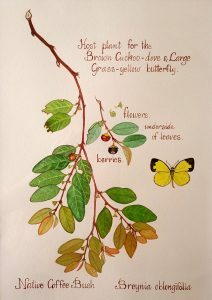 My fascination grew even more when I was lucky enough to observe various butterflies settling on native host plants in my garden, so of course I was compelled to illustrate these special events! 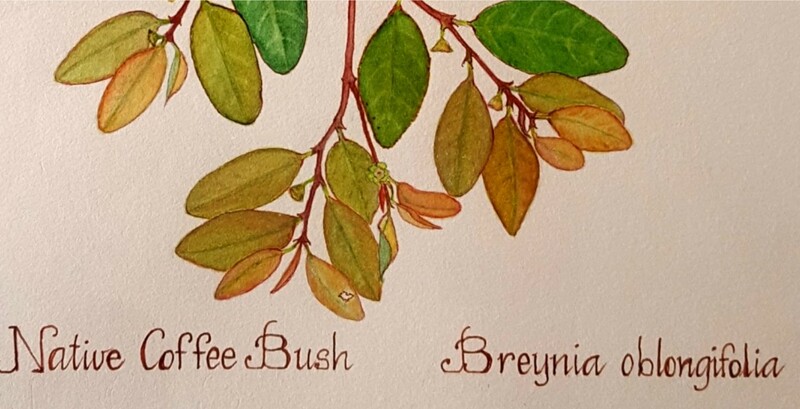 Illustrations of Australian flora by renowned botanicals artists such as Ferdinand Bauer, Ellis Rowan, Vera Scarth-Johnson and Kathleen McArthur, to mention but a few, inspire and energise me to continue this quiet, contemplative art form using water colour, pen and pencil. Botanical illustration is defined as the symbiotic relationship between science and art. Respecting the characteristics of plant subjects is essential, demanding patience and persistence, often following development through the seasons from flowering to fruiting. The Art of Botanical Drawing by Agathe Ravet-Haevermans, Scientific Illustrator, Museum of Natural History, Paris. Create More Butterflies by Frank Jordan and Helen Schwenke; Discovering Australian Butterflies by Vanessa Bugg. When you pause to take a closer look, you never know what you may discover!